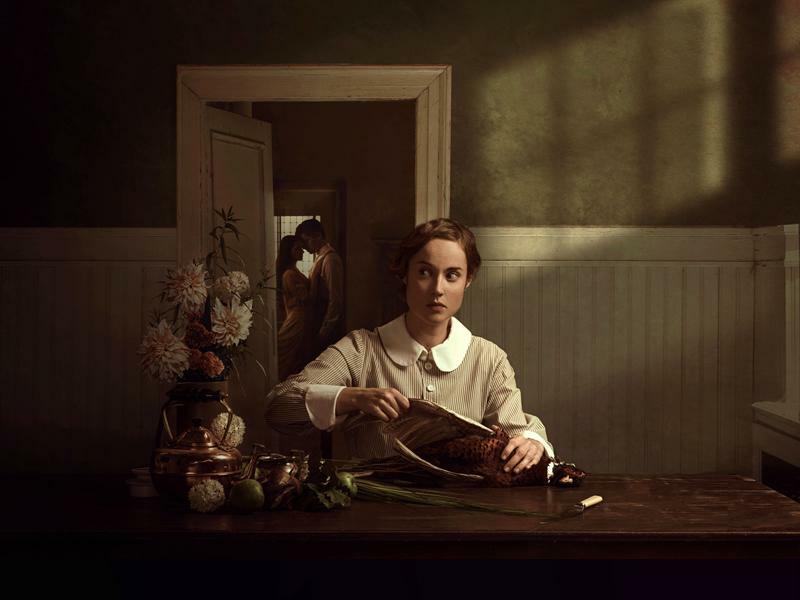 Zinnie Harris’ Scottish adaptation of August Strindberg’s Miss Julie begins as the audience are taking their seats: we see the maid, Christine, preparing a pot of bloody entrails in a kitchen as she wipes sweat from her brow. This conflicting scene of easy domesticity and gore sets the tone for the rest of the performance. The whole play is set in this kitchen in the laird’s house, as the uproar of the 1926 General Strike continues outside. On this intolerably hot Midsummer’s evening, Julie, the laird’s daughter, and John, his favourite manservant, come together with ultimately devastating consequences for everyone involved. The staging of the play is by far its biggest strength. The kitchen, which at first seems to be a place of domestic comfort bathed in warm, pink light, becomes claustrophobic as the play goes on and we see how hopelessly trapped Julie and John are in their respective class roles. The three actors give strong performances too, and the rising tension and conflict in each relationship is gripping (although Hiftu Quasem’s Julie occasionally teeters on the edge of the melodramatic). Helen Mackay gives a particularly compelling performance as Christine; she is an incredibly sympathetic figure, which provides a counterpoint to the sometimes intensely unlikeable Julie and John. The use of Midsummer’s evening – a liminal space where boundaries can be traversed, and people can transform into something other – as the setting of both the inter-class relationship and the strikers’ dance is also very effective. There is a sense that on this night, anything goes; there is revolutionary potential in the air. This delusion is brutally shattered the next day, when the strike fails, and the couple realise they have been caught in the act with no way to escape the laird’s fury or, indeed, the house, which is a prison trapping them within their class. However, the play is let down by its predictable depiction of class conflict. It is a familiar story: the spoiled, upper-class girl feels isolated by her wealth; the manservant is resentful of her but can’t help lusting after her; their differences are irreconcilable and their relationship is doomed. This is perhaps understandable given that the original play was written in 1888 (and, as it has been performed regularly around the world ever since, something about this story clearly still resonates with us). Ultimately, Miss Julie is a gripping, intense study of the dynamics between three characters in a love triangle, but if you’re looking for a nuanced portrayal of class conflict, you may leave feeling disappointed.